Mainly cloudy. High 63F. Winds light and variable.. Considerable cloudiness. Low 42F. Winds light and variable. The suspect in the shooting death of a Cowlitz County Sheriff’s deputy has been identified as the half-brother of a convicted police chief killer, multiple news outlets reported Monday. As this three-part series on rugby has uncovered, many of the sport’s players and coaches refer to the seemingly hard-charging and merciless sport as a “brotherhood.” Back in 2010, no one needed that sense of family and camaraderie more than Luke James. Real estate: Should you go it alone, or get a pro? As 49-year-old horse trainer Miguel Gomez stood in the sun, lovingly stroking the head and face of Diamante, his 4-year-old Azteca stallion, the horse looked as though he might fall asleep right there. As soon as Gomez led Diamante into the outdoor round riding area at the FarmHill Equestrian Center and climbed into the Spanish saddle, it was a whole different story. Still docile and sweet, Diamante became noticeably full of energy and looked ready to prance around and please his rider however he could. After simply walking Diamante around the outdoor area several times, Gomez began giving him commands in his native language of Spanish and the walk turned into the dancing motion of passage. Passage is a dressage term in which the horse performs a highly-elevated and powerful trot. The horse appears to trot in slow motion, making it look as if it is dancing. Gomez and Diamante did the passage with ease around the riding area several times until Gomez once again gave Diamante a different command, moving him into the piaffe. Another dressage movement, the piaffe consists of a horse being in a highly-collected and cadenced trot, in place or nearly in place. Diamante performed this movement like a pro for several minutes before resuming the passage. Gomez recently sold Capricho to a friend from the El Rancho Viejo restaurant in Battle Ground, but both Diamante and Revelde belong to Gomez and live at FarmHill. The stallions’ mother, Lucero, also belongs to Gomez, and she is currently in Salem for breeding. Gomez said he started training horses back when was about 8 years old and living in Mexico. 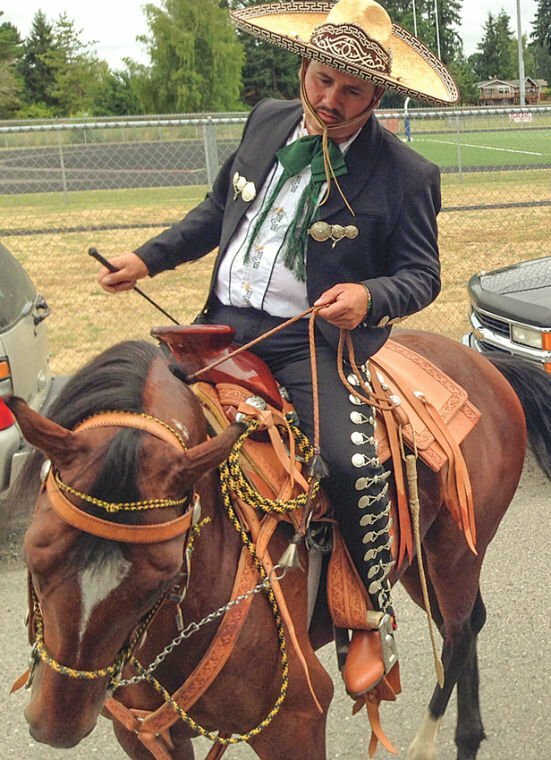 His father trained Mexican dancing horses in Mexico and Gomez thought it looked fun and started helping out. He enjoyed it so much that he decided to keep doing it after moving to the United States. Diamante is the youngest of the three stallions Gomez has been training. He started his training at about the age of 1, about three years ago. Barbara Hort, managing owner of FarmHill Equestrian Center, said Gomez first started Diamante’s training with a lot of groundwork, moving on to the more advanced dressage training when he was about 2 years old. In addition to the dancing skills Diamante has learned so far, Gomez also has the horse trained to bow and kneel down. He is still working with him on sitting, laying down and turning in a circle, all things that Gomez said Diamante will learn quickly. Gomez’s wife, Juanita, is also the ranch manager at FarmHill. All three of Gomez’s stallions – Diamante, Capricho and Revelde – recently made an appearance in the Battle Ground Harvest Days Parade on July 19. They also participated in both last year’s and this year’s Hazel Dell Parade of Bands. Last year’s Hazel Dell parade was the first parade for Diamante. “He was a bronco at that parade,” Gomez said, laughing. “He was a bit scared." 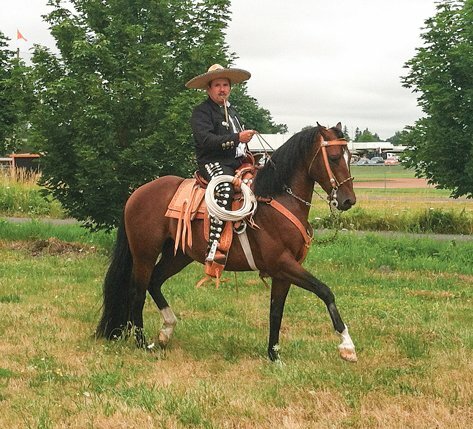 Gomez hopes to take the horses in more parades next year, including the Hazel Dell, Battle Ground and Ridgefield parades. He tries to get the horses ready for the crowds of people and loud noises that come with being in the parades as a part of their training. When the stallions are put in the stocks for training, there is always loud Mariachi music playing so the horses can get used to it. FarmHill is a full-service dressage and jumping facility that is home to 34 horses and their owners. Riding facilities at FarmHill include a 60-by-120-foot indoor arena with lights, mirrors and shredded cedar bark footing; a 20-by-60-meter outdoor arena with full drainage system and a mixture of granulated rubber and crushed gravel footing; two 60-foot diameter round pens with a mixture of granulated rubber and sand footing; and a 100-by-300-foot outdoor jump arena with a full drainage system and chipped cedar footing. FarmHill also offers riders the option of riding along the paths through the additional 7 acres of wooded property, an enclosure that contains log obstacles, a small stream and other elements that are ideal for developing a cross-country course. Various lessons and training are also offered at FarmHill. Dressage instruction and training is done by Harriet Hauser, and regular clinics on dressage are offered with Suzan Davis Atkinson and Pierre Cousyn. Riding lessons for beginners are offered at FarmHill by trainer Rebecca Buehler. Adults and children ages 7 years old and older can learn English and Western riding in a private lesson format. Jumping lessons are offered by Jane Varley, and jump clinics are also offered by Anna Collier and John Camlin. Hort and her husband own three of the horses living at FarmHill, all of whom compete in dressage. To learn more about FarmHill Equestrian Center, located at 23118 NE 37th Ave., Ridgefield, visit their website at www.farmhillequestriancenter.com or call (360) 887-8087. Should Battle Ground merge with Fire District 3? Should Washingtonians fund Inslee's campaign security? Do you think Washington taxpayers should be responsible for the cost of security while Gov. Jay Inslee travels and campaigns in the presidential election?